When it comes to planning, preparing for, and executing a long-distance bicycle tour, there are 7 major mistakes I see bicycle tourists making over and over again. In the video above you will hear me discuss these 7 major bicycle touring mistakes… and I will give you some alternative ideas, strategies, and approaches that you can use to make sure you don’t make these same mistakes on your own bicycle touring adventures. In the first 45 minutes of the video I discuss the 7 major mistakes made by bicycle tourists… and in the later half of the video I take questions from readers and answer those questions live! So watch… and enjoy! And if you have any questions about any of the 7 major points I make in the video, just leave a comment below and I will do my best to get back to you with an answer as soon as I possibly can. This video was recorded during a live event that took place on May 24th, 2011. This entry was posted in Bicycle Touring Pro - Webinars, Bicycle Touring Pro Articles, Featured How-To Articles, Main Articles, Planning, Videos and tagged 7 major bicycle touring mistakes, bicycle touring pro, bike touring crashes, bike touring danger, bike touring mistakes, dangers of bicycle touring, darren alff, major mistakes, mistakes made, outdoor accidents, outdoor mistakes, professional bicyclist, professional cyclist travels, theft of bicycle tourists. I don’t suppose this could be transcripted for those of us with old computers. Watching these videos start and stop, pause and skip, becomes so distracting that it is hard to glean the original benefit. Sorry. It’s not that I don’t appreciate all your hard work. It’s just that a new computer is about a year and a half down the road. I’d love to get someone to transcribe this video, but I don’t have the time or money at the moment. In the future though, I would love to get long videos like this one transcribed. What about maps and electronics. GPS – German or iphone smart phone with map programs it also has camera. Then i need to charge these electronics during the day. I also need to bring printed route maps. and a phone. thinking just iphone and printed map. Yes, the fact that the iPhone and other similar smart phones now combine several, once separate, electronic devices (camera, phone, mp3 player, gps, etc) now means that you can travel even lighten than you could in the past. But yes, you still have to worry about charging that phone each day, making sure it doesn’t get wet or damaged, etc. If you plan to use your cell phone for navigation, I still recommend that you carry physical maps of some kind, just in case you lose your phone, it breaks, you are in an area where there is no service, you can’t charge the phone, etc. Good stuff, Darren. It would be great if you could write up a short synopsis or highlights, even bullet points. I don’t have time to watch an hour-long video, but I can get the same information quickly if I skim, and if I see a topic that interests me I can go to that part of the video. Keep up the good work! I’m taking Marty’s advice and multi-tasking, listening while working on something else. I am *cracking up* at the story about the guy who couldn’t set up his tent. Glad I decided to listen! Once, I slept on the open ground in Shenandoah National Park once, in a well-populated campground, and was awakened in the middle of the night by a critter scuffling in the dry leaves near my head. I sat bolt upright and hissed sharply, as I’d learned to do to get Eastern gray squirrels to scoot out of the way of my front wheel. It was an automatic reaction. The animals froze, and then I saw that it was a skunk! It was three feet from my head. Luckily, it just quietly ambled away, without spraying. Yikes! Then you just got to figure that no amount of GPS, Iphone, map or anything else is gonna be good enough. I just returned from a 540 mile trip with a few friends. While stopped in rural IA deciding what to do about a road closed sign we saw and (passed) TEN MILES back, a local farmer pulled up to assist us. As he was looking at and trying to figure out the adventure cycling map we had he said, “Boys why don’t you get yourself a real map.” It was all a good laugh and the farmer called the foreman of the road crew to see if we could walk our bikes through the construction. Bottom line?? Get yourself a “real” map. Everyone have no amount for electronics things like Iphone, and other similar thing. – What about a portable solar panel for charging electronics as you cycle? – Are there any tracking devices available one can use on yourself / bicycle while travelling in Africa that you are aware of? As for GPS devices in Africa, I don’t know of any that give you a good overview of the roads, etc. To be honest through, I haven’t done a whole lot of looking for such a thing. For Africa, you might just be stuck with using the GPS as a sort of expensive digital compass, which would tell you the general direction you are traveling and approximately how far the next city is (as the bird flies), but nothing so precise that it actually tells you were the roads are, where you need to turn, how long it is going to be until you reach your destination, etc. I have just finished watching your video on the 7 Mistakes and now write to compliment you on your presentation. The content was excellent and I found myself in full agreement on most points but not all. Of course, I can only speak of bicycle touring in Australia. Here, it would be unthinkable to leave the camping and cooking gear at home for an extended tour. Otherwise, all that you said is applicable and nothing could be more calculated to ruin a bicycle tour than the mistakes you mention. On a personal note I have always travelled solo; I always carry enough food and water to allow me to make an impromptu bush camp for 2 or 3 days if I find a spot which appeals; I only travel until lunchtime, leaving the afternoon free for R&R, repairs, cooking, reading etc; I do not pre-plan beyond having a general idea of my destination – thus I maintain complete flexibility as to my daily route; I spend at least as many days not travelling as travelling; I like to go away for 6-9 months; and in short, I have a helluva good time. But then, being 76 years old and footloose I have the freedom to go as I please. It was not always so. Really useful thoughts here, thanks for sharing Darren ! Actually a cellphone pseudoGPS (Google Maps in fact) came in quite handy a couple times riding through Germany a couple weeks ago. Once to let us know that we had taken the right road; it was a main one with loads of trucks going on so we wanted to be sure we wouldn’t have to ride that one back. Second one when looking for a ‘lost’ Bett&Bike very late at night. Fun enough it was not the empty space in between but the dim and unknown urban areas that were the real problem ! Good talk as usual Darren. I think most people touring independently as do you really should carry some basic camping gear, and at least minimal cook kit. If for no other reason than because they will eventually get caught out on the road after dark. There has been much advance in minimal camp gear in the past decade, modern ‘ultralight’ camp gear can really reduce bulk and weight. Websites like ‘Backpacking Light’ are chalk full of fanatics about lightweight gear who have great tips about buying, using and making this stuff. I use a single-wall floorless silicon nylon tent that weighs about a pound; a specially cut sleeping blanket that’s much lighter than a sleeping bag. Yes I have pillow. It’s an inflatable pillow that weighs a couple of ounces. A minimal cookpot/mug along with an alcohol stove made from a cut-down soda can allows minimal cooking and water heating for washing; alcohol is widely available around the world so you don’t have to carry a lot of it with you all the time. Darren I think when you hit 40 you’ll develop an appreciation of the ability to drink a cup of java in the A.M. no matter where you are. My camp set is small and light enough to fit inside my air travel carry-on bag along with everything else. I recommend getting both a digital hanging travel scale and a digital kitchen type scale to weigh gear and help with decisions. Sounds geeky but you’ll likely be surprised and enlightened (NPI) by what you discover about your gear. In addition to the consolidation of electronic gadgetry modern smartphones have some other real advantages. There’s a great phone app called “Bike Repair” with videos and photos that can help folks with basic bike repairs on the road, and it weighs nothing to carry. With a data or WiFi connection sights like Virtual Tourist, BootsnAll, and Hostels.com a phone can help you dynamically plan lodging (and sightseeing) enroute. Thanks for the videos and info here on your site. I’m currently in Berlin, Germany and am planning to cycle home to the UK in a couple of months time. 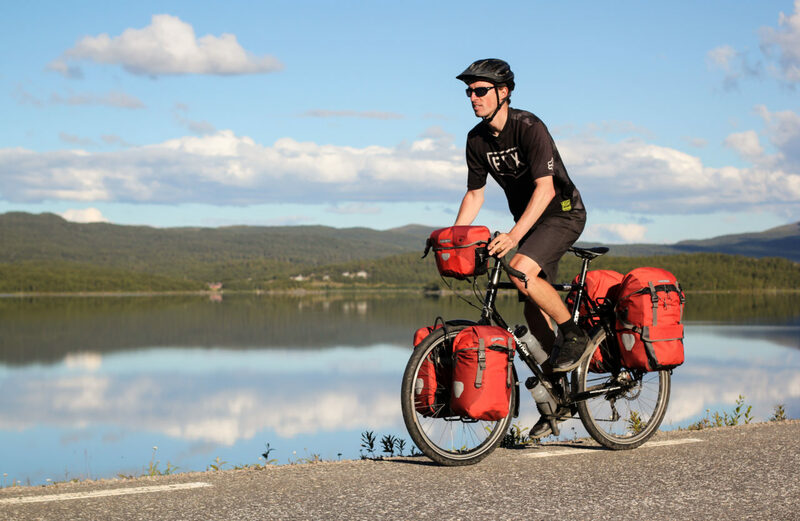 Do you have any useful resources you’d reccomend for bicycle touring in Europe? I’d be planning to cycle Berlin-Amsterdam then along the coast through Holland, Belgium and into France before crossing on the Ferry to England. I’m completely new to Bicycle touring and have decided to spend the summer fixing and selling bikes here in Berlin trian my legs and my Mechanics before heading off. I’m not earning alot so it’s going to be a super budget trip. I’m thinking about doing some couch surfing and Stealth Camping but i’m interested in your own experiences in this part of the world. I understand you’re doing this kind of trip in the reverse at the moment so it’ll be great to hear how it’s going and how you found it. Thanks Darren all the best and Enjoy your latest european travels. I don’t know if I have any big secret tips for bicycle touring in Europe that I haven’t already covered elsewhere on the website here at http://www.bicycletouringpro.com or inside The Bicycle Traveler’s Blueprint. But yes, staying with people from the Warm Showers, Global Freeloaders or Couchsurfing list is a great way to go. Camping is inexpensive as well. I prefer to mix it up between camping and staying with friends/strangers. Stay tuned here at BTP for more tips, etc… as I’ll be cycling in Europe for the rest of the year. Have a great time on your journey! My screen comes up blank… no vidoe, no text..
That’s weird Ron. What kind of device are you viewing the website on? What what browser are you using? Let me know and maybe I can solve the problem. Can you view any of the other pages on the website at http://www.bicycletouringpro.com? It is unfortunate but I canot see your videos on my Ipad….. Maybe you should consider making them ipad friendly . I’m sorry about that Zsolt. It must have something to do with the way Ustream encodes the videos. Yes, transcribing would be terrific. I enjoyed all the comments.Love what you do.I’m taking off soon on a tour around the So Cal desert with my bike trailer carrying my gear and a Honda motor friction drive pedal assist on my bike.My disability is not preventing me from enjoying a tour. Love all your posts, thanks so much. Daren, I read you don’t wear cycling shorts. In other words shorts with a chamois in them. You obviously put a lot of miles on daily. No chaffing? No rash? I tried riding for 10 miles once and almost got burned. so, why don’t you wear cycling specific shorts? That’s right. I don’t wear cycling shorts. I just wear skateboard/surf style shorts… and no, I’ve never had any chaffing, rash, etc. I don’t wear cycling shorts because they smell after 1 day, they have to be cleaned constantly, and they look funny whenever you are off the bike. I spend a lot of time walking around and interacting with the locals on my tours, and therefore I don’t like to be wearing skin-tight cycling shorts (which many people around the world are uncomfortable about). If you want to wear cycling shorts, however, that’s totally fine. There’s nothing wrong with that. It’s really more of a personal preference than anything else. But it also depends where you traveling in the world and what your personal goals are for your own bicycle touring expedition(s).